In the spring our American Goldfinches need a lot of energy to change into their bright spring coats. My feeders have been covered in hungry birds. 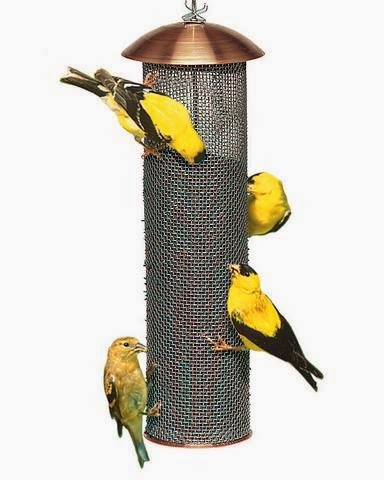 Our Wild Birds Unlimited Copper Mesh Nyjer (Thistle) Feeder is a finch magnet. I have three of these feeders. The Stainless Steel mesh tube not only lets finches land and feed in whatever position they choose, but it also allows air circulation to keep your seed as dry and fresh as possible, something that’s very important to our picky eaters. The Copper top and bottom are beautiful but still designed to be easy to clean and fill. I just slide the outside clip to fill or the inside clip to clean. Filled with nyjer seed, the birds will flock to your feeder. It holds 1 quart.